Goleta is a nicely established residential area of tract homes. Many of the engineers and employees of the aerospace companies live in this area. Above Cathedral Oaks Road you move into an area of rolling hills and views of the ocean and mountains. There are some fine residences and citrus and avocado ranches. There is an abundance of condominiums and housing developments offering a variety of affordable living. The principal industrial sector of Santa Barbara County is located in the City of Goleta. The City is home to approximately 80 research and development firms in the hi-tech field including those that specialize in electronics, telecommunications, medical research, national security and remote sensing manufacturing that contribute significantly to the local economy. As you pass through the gate and under the handsome, fillgreed sign suspended across Las Palmas Drive, you enter another world named Hope Ranch. Towering plams, planted in the early 1900’s, line the main drive. Wearing jodhpursand shiny black boots; young children on horseback gallop along the tree-lined trails. An early morning jogger circles Laguna Blanca lake. Hope Ranch is a community encompassing 1,863 acre. It is situated in the southeastern portion of Santa Barbara County between Highway 101 and the ocean. It consists of a broad flat mesa andlow rolling knolls broken by a magnificent valley and covered with splendid live oaks. The scenery from the home sites on the knolls is indescribably beautiful. A golfing foursome takes turns putting on a manicured green at the La Cumbre Country Club. Incorporated in 1924, the Hope Ranch Park Homes Association watches over this elite residential area. Membership in the association is automatic upon purchasing a home and brings many privileges: the private beach, bridle paths, tennis courts, and the advantages of the Hope Ranch Riding Trails Association. Santa Barbara has a diversity of residential areas. Made up of many neighborhoods and areas you will find information provided on several below. The Mesa is located on the bluffs just beyond the harbor and extends from the ocean up to the top of the hill. There are both tract and custom homes, many with ocean and/or city views. San Roque is a charming area with smaller, individual homes in a quiet, yet convenient in-town location. Architectural styles range from small California cottages to classic Tudors and Spanish haciendas. The Wilcox Property, now known as the as the Douglas Family Preserve, at southwestern tip of the Mesa was a commercial nursery, currently preserved for public use. The neighborhood between Mesa Lane and Oliver Road, while originally plotted as early as 1920, did not develop until after World War II when many veterans built homes with the help of GI loans.City weather records show that the Mesa’s winter temperatures are 10 to 12 degrees warmer than downtown, and 10 to 12 degrees cooler in the summer. The “Westside Story” of Santa Barbara is laid in our city’s first suburb to be initiated by Anglos rather than Hispanics; the Spanish genesis of the city was located on the Eastside. In 1850, when the United States annexed California to the Union, the Westside was open grazing range and farmland, turning marshy near the beach. Today this area is solidly overlaid with urban development extending inland to the Goleta Valley, making it the most densely populated neighborhood in Santa Barbara. The earliest historical reference to the Westside came in 1793 when Captain George Vancouver, a British explorer-scientist, who was circumnavigating the globe, anchored the Discovery off West Beach and received permission for his seacook to chop stovewood from the Mesa oak groves and refill his water tanks from a steep at the base of the Mesa bluffs near Pershing Park. Mission Canyon, which with the Old Mission complex and the area bounded on the south by Mission Street, making up Santa Barbara’s “Mission District,” is unique. No residential neighborhood in the city boasts a richer historical background, or offers more relics and landmarks of Old Spanish Days.Fr. Junipero Serra, when he helped found the Royal Presidio of Santa Barbara in 1782, intended Santa Barbara’s Franciscan mission to be built in El Montecito near the present site of Our Lady of Mount Carmel church on East Valley Road. But four years later, when his successor, Fr. Fermin Lasuen OFM, arrived to establish our mission, he decided that Montecito was too infested with grizzly bears and renegade Indians to risk building a mission so far removed from the protection of the presidio soldiers, so he looked elsewhere. Few residential neighborhoods of Santa Barbara can boast the rich historical background of the San Roque and Rutherford Park areas. Ten thousand years ago the area, bounded by Ontare Road, Foothill Road, Alamar Avenue and State Street, was an open expanse of treeless grassland, sloping up to the knees of the foothills and bisected by the jungled course of San Roque Canyon. Now a built-up, economically stabilized suburb, it is admired for its sweeping curved streets, its luxuriant landscaping, and its harmonious blend of many architectural themes – Spanish Colonial, English Tudor, French Normandy, California Redwood, Italian and American Colonial, mostly built since 1925. San Roque features older, custom homes with charm. Samarkand meant “the land of heart’s desire” in the archaic Persian tongue. It identified the fabulous Asian city where a mythical Queen Scheherazade spent her 1001 Arabian nights. In Santa Barbara, the melodic oriental name was first applied in 1920 to a deluxe Persian style hotel, formerly a boy’s school. As the dominating landmark of a hilly, elevated neighborhood, the Samarkand gave its name to an area bounded on the east by Oak Park, on the north by Hollister Avenue (now De La Vina Street), on the west by a ranch boundary fence centered on modern Las Positas Road, and on the south by the old Coast Highway and the railroad. Samarkand is a delightful area of homes full of charm. Bridging the two mile span which separates Mission and Sycamore Canyons, the sylvan uplift which the padres knew as the “mission ridge” has for the past 65 years been known as “the Riviera” due to its resemblance to slopes along the Mediterranean coasts of France and Italy. Santa Barbarans lucky enough to live on this ridge attach premium value to their homes because of their unsurpassed views of the city, mountains, sea and islands. 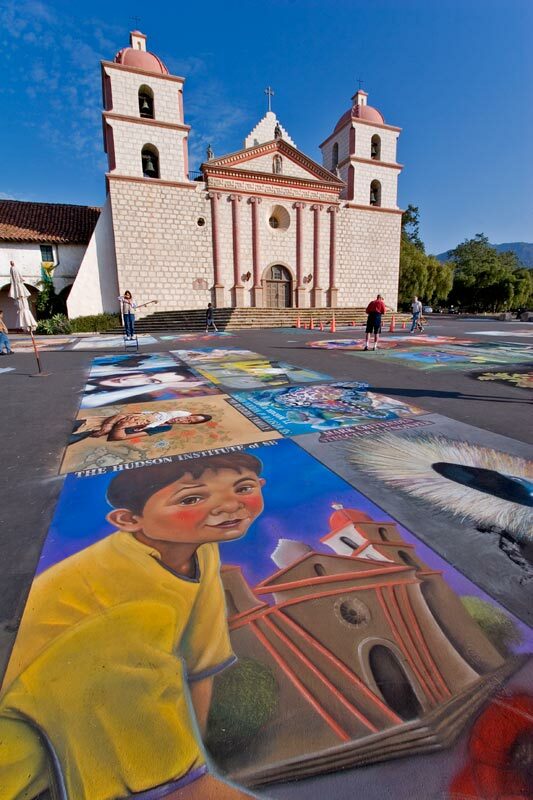 The Spaniards who founded Santa Barbara in 1782 were soldiers and priests, not seafaring men. Perhaps that is why no provision was made for a seaport. The waterfront, extending 3.6 miles from Shoreline Park to the Bird Refuge, offers no natural headlands to create a safe anchorage. Early-day mariners dreaded Santa Barbara’s exposed roadstead so much they used to drop anchor a mile offshore, ready to slip their cables and head for the open sea if foul weather threatened. As recently as 70 years ago the ocean used to cover what today is the City College football field, dashing its surf against cliffs now paneled by La Playa Stadium. Leadbetter Beach did not exist. But just around the corner, east of Castle Rock (a long-vanished promontory), semi-sheltered West Beach became the traditional landing place for visitors. It is thus overlaid with history covering two centuries. Once a fashionable health resort, the tiny seaside village of Montecito was discovered just after the turn of the century by some of the most influential families in the United States. Soon the wooded Montecito hills, just east of Santa Barbara’s city limits began to sprout such magnificent creations as marble palaces, picture-book Normandy castles, elegant Italian palazzos, gracious Cape Cod colonials, and regal English manor houses. For those looking for private schools, country clubs, quaint shops, and quiet lanes that lead to secluded homes, the beach, mountain trails, creeks, and waterfalls – pastoral Montecito is waiting, pristine. Just south of Montecito is a quaint beach community named Summerland; a relaxed, hillside community snuggled on the coast with breathtaking ocean and island views. Today it is a thriving beach community with 1,545 residents living in 785 homes, condos, or apartments. Summerland is known up and down California for its wonderful weather, friendly residents, good restaurants, outstanding beach, and wonderful antique stores.